Frustrated with all the glue products on the market that did not meet her needs for mosaic art, long time mosaic artist, Tina McIntire decided to have a glue created that would dry quick, have a water resistant bond for outdoor projects,completely clear with no color hues. MAC needed to be thin enough to draw intricate patterns for glass or beads to be laid onto. Though originally intended for personal use word got out about an artist that had a glue that solved all the problems of glue used for mosaic and glass art. A glue designed originally for her own personal needs as a mosaic artist was now the business of an artist. And so MAC glue was born…. MAC is created for glass art by a glass artist. 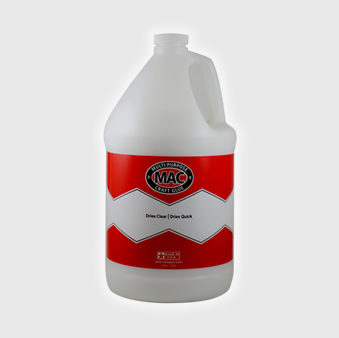 MAC Glue is a multi-purpose quick drying glue. 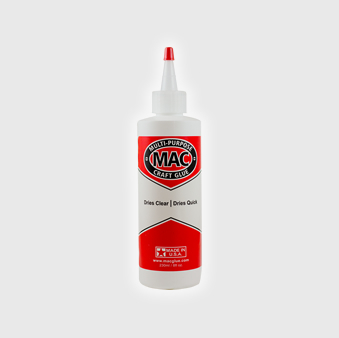 Though its quick drying, flexible, crystal-clear, water resistant qualities make it the premier glue for mosaic art it works great for virtually any surface to surface bonding. These surfaces include, but are not exclusive to, tile, glass, wood, concrete, ceramics, leather, rubber, plastic, terracotta, most fabric, and carpet.